United States officials pushed back against reports saying that Washington was planning to recognize the YPG-led Syrian Democratic Forces (SDF) as a diplomatic entity that controls a vast territory in eastern Syria. Such a move would surely increase tensions with NATO ally Turkey as it would jeopardize the territorial unity of the country. A U.S. State Department official told Daily Sabah on Monday that the U.S. still supports the territorial integrity of "a unified and democratic Syria in which the rights of all groups are protected." The official referenced United Nations Security Council Resolution 2254, which has previewed a political transition and election process for the future of the war-torn country. 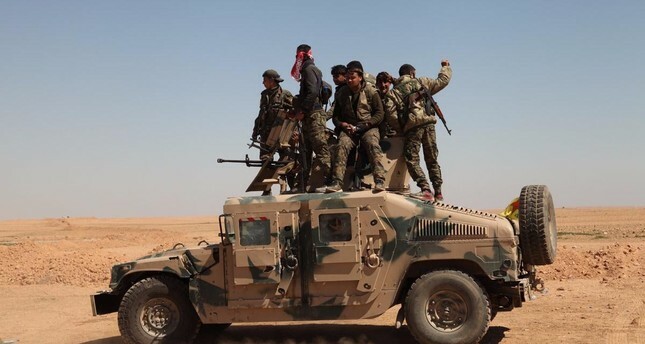 Saudi-owned Asharq Al-Aswat, referencing a senior Western official, claimed on Sunday that Washington was expected to take steps to formally recognize eastern Syria as the territory of the "Kurdish-Arab Syrian Democratic Forces." To back this claim, the newspaper underlined U.S. Defense Secretary Jim Mattis's statement which said that Washington would employ diplomats in SDF-controlled areas to help rebuild their infrastructure, and basic services. The report also said that the U.S.' policy for such a recognition would be later completed by implementing stages like the training of government agencies, protecting SDF areas and the upkeep of military bases. Mattis last month acknowledged that the U.S. wouldn't pull out of Syria until political negotiations in Geneva reached a settlement. In a written statement to journalists, Pentagon Spokesman Col. Robert Manning said the U.S.-led coalition continued to operate in Syria, as consistent with the U.N. Charter. He reiterated the U.S.' view that reconstruction and rebuilding activities were essential to prevent Daesh from regenerating itself or returning to the areas it lost. Former diplomats told Daily Sabah that they don't expect a U.S. recognition of SDF-controlled areas anytime soon, since there would be many issues to resolve before taking such a step, including terrorist group PKK's involvement with the SDF structure. However, some experts say its final recognition is almost inevitable. Nicholas Heras, Middle East Security Fellow at the Center for a New American Security, said: "President Trump's Syria strategy is still being developed, but the overarching objective of that strategy is becoming clear: to maximize U.S. leverage on the ground inside of Syria to wind down the war, provide safe spaces for refugees to return, and to plug governance gaps used by [extremist] groups to target the United States. From the U.S.' viewpoint, the SDF is a key component of the strategy to achieve these objectives." Heras, who is known for his close proximity to the Pentagon, suggested that the Trump team naturally perceives the SDF as a natural heir for the territories saved from Daesh with U.S. military support. "...Whether other actors like it, or not, there is no walking back on the SDF, or reducing its importance to U.S. strategy in Syria," he added. The Pentagon continues to invest in the so-called SDF. U.S. Central Command (CENTCOM) Commander Gen. Joseph Votel announced last month that they would establish border forces in Syria, which he said would help prevent the resurgence of Daesh. An Anadolu Agency report claimed on Tuesday that a group of 400 fighters from the SDF have already been trained as border guards. The group, "named as the North Army by the PKK, was provided with technical training as well as military training and 'high-tech equipment'," according to the report.